This week on The Bugcast: a brief tribute to Grenfell Towers, and an interview with Mark Marshall, and our amazing selection of 6 amazing tracks of Creative Commons and Independent music from Mercury And The Architects, RogerThat, SadMe, and Mark Marshall. the bugcast 465 – Oh [insert deity name] help us! This week on The Bugcast: Yannick and Lainey step in for Dave and Caroline again, not much waffle, but their quality selection of 8 amazing tracks of Creative Commons and Independent music from Kinematic, Alex Cohen, Fader Hill, RogerThat, Indytronics, Danielle Helena, Color Out, and Kane Brown. This week on The Bugcast: we talk in-depth about Manchester, and cover a couple of other topical news stories, and our amazing selection of 8 amazing tracks of Creative Commons music from The Bourgeois, Plastic Light Factory, Stefan Kartenberg, Explosive Ear Candy, Vitne, RogerThat, Geebz, and Stonyroad. 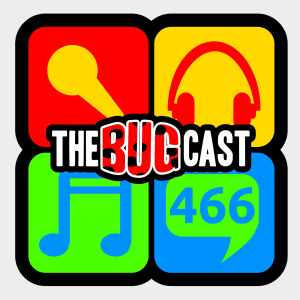 This week on The Bugcast: politics, poditics, podcrawls, and 8 amazing tracks of independent and Creative Commons music from Aphemia, Charlie Mosbrook, Kinematic, Paul Manandise, Mickey Blue, Familia Reggae, RogerThat, and My Creepy Susanne.